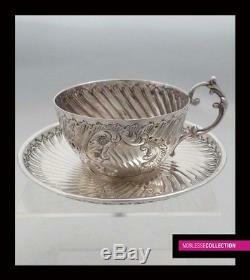 ELEGANT ANTIQUE FRENCH STERLING SILVER COFFEE CUP OF Rococo style. Dear collector, Noblesse Collection is happy to propose you through the photos which follow these gorgeous. 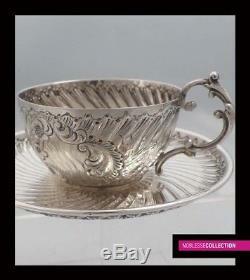 Coffee cup and saucer made in the 1880s with an elegant design of French Rococo style. 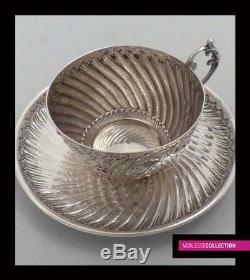 Cup with its saucer dating more than 130 years old to start or complete a fine French silverware collection! 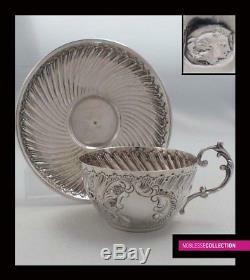 Cup and saucer are stamped by the French Minerva 1st silver Hallmark 950/1000. Cup and saucer are stamped by the maker's mark : Leon LAMBERT. He practiced from 1881 till 1904 in Paris, 123 rue Vieille-du-Temple. 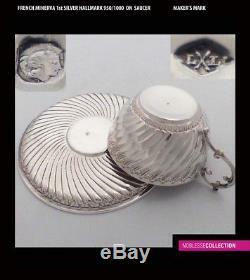 Weight of cup & saucer : 105 grams 3,37 Troy Oz. Diameter of the cup (without handle) : 7,0 cms 2,75 inches Diameter of the saucer : 11,7 cms 4,60 inches. Total height : 5,4 cms 2,12 inches. In perfect condition : Fully checked and cleaned by our silversmith. If you change your mind for whatever reason, we accept the return within 30 days after the reception of the parcel. 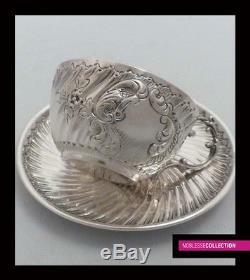 The item "FINE ANTIQUE 1880s FRENCH STERLING SILVER COFFEE CUP & SAUCER Rococo style" is in sale since Monday, February 19, 2018. This item is in the category "Antiques\Silver\Sterling Silver (. 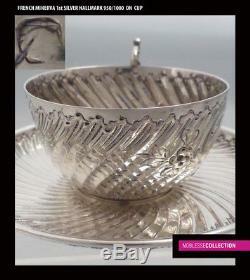 The seller is "noblesse-collection" and is located in Le Mans.